Step 1. Background. 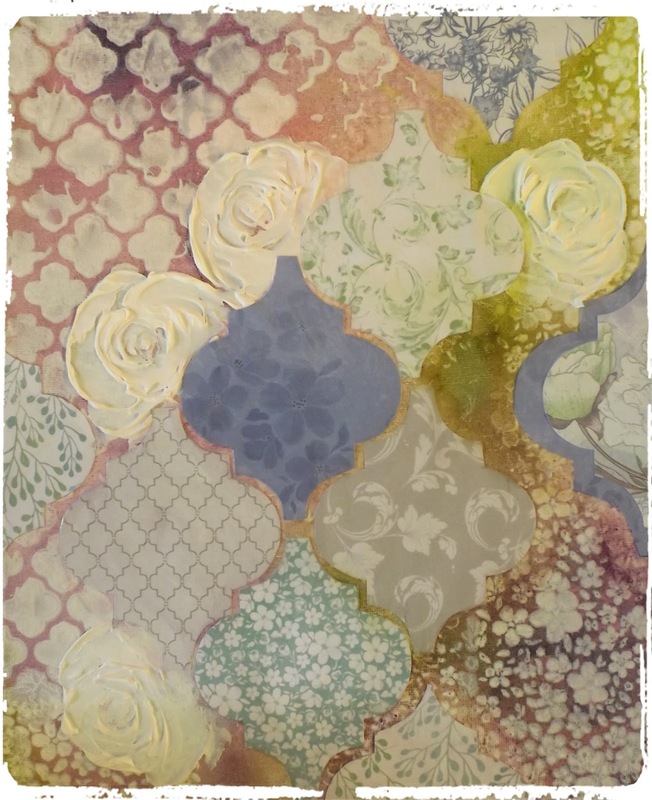 One side of the double page spread take a piece of acrylic lace, then swipe through some texture paste with a palette knife for a great stenciled pattern! On the other page, use the white backing paper from a paper napkin, crumple it and then spread over the page, glue down with matte medium, creases and all! Allow to Dry. I have used all of these 3 colours in different parts of my page. Paint on the colour, leave maybe 30 seconds, use a paper towel to remove excess paint, creating a vintage look, if you want to remove more colour , next use a baby wipe. I love this product! Step 3. 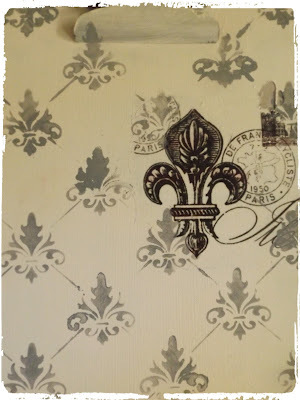 Stamp the images you want to use in your collage on lunch wrap paper using an Archival Ink Pad. I am sure most have a collection of stamps that will work fro this project. Collage your paper pieces and adhere them to your page with matte medium. 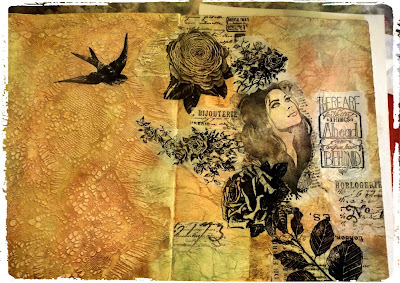 You can fussy cut some images and tear around others, overlap and just be creative!
. 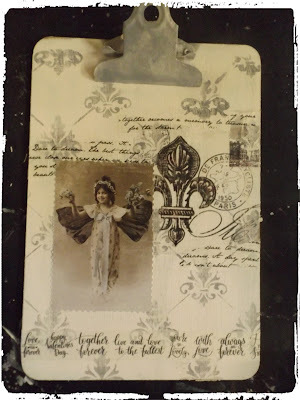 At this point I also went around my page edges with Tim Holts Distress Ink in "Vintage Photo", you can also smudge a little of this over your papers to take away the 'white' look, it helps fade the images into the background. Step 5.Nearly Finished! 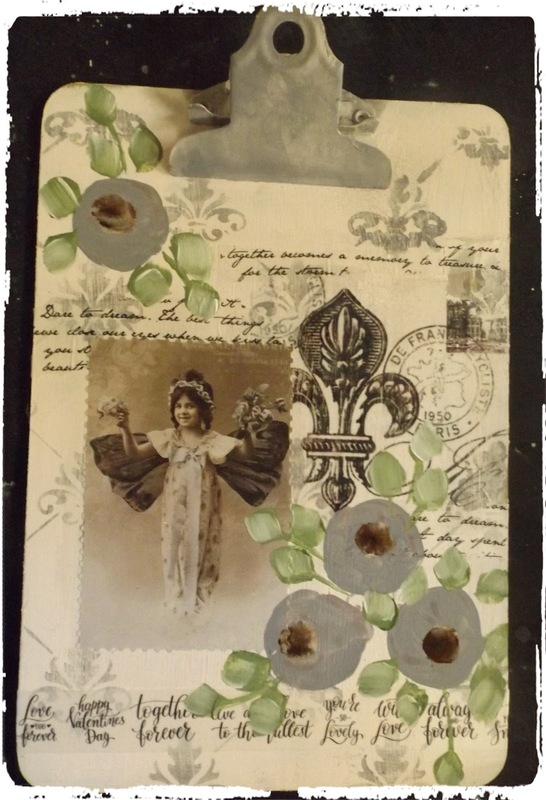 I have stamped some leaf images straight onto the paper around my collage. 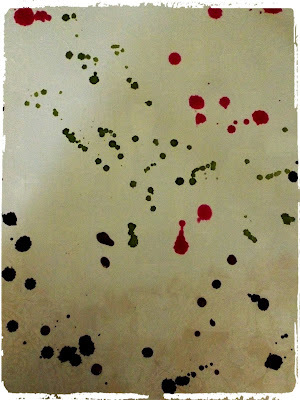 Using a fan brush I have speckled lightly over the project with thinned white paint. 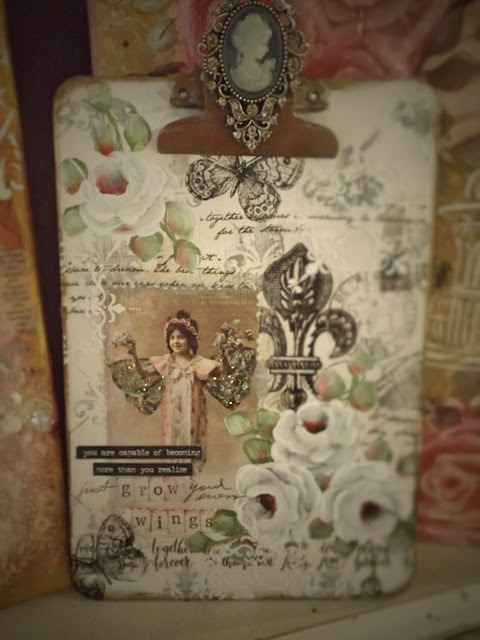 Now add a little Tim Holtz Distressed Crayon in Black around your girls hair, rub your finger over the crayon to smudge it out and create a little shadow around her. Allow to dry naturally for best crackle effects. Step 6. Okay final last details now. Stamp some more ink leaves around your white roses. 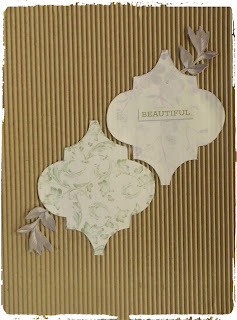 I then chose to add some Decoart crackle paste leaves using a stencil to fill in my page a little more. I think she is finished! 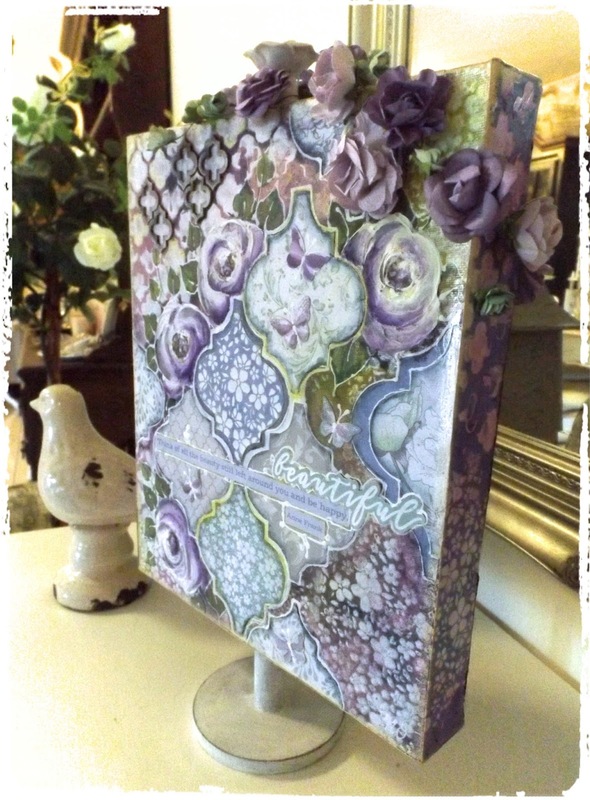 Basecoat clipboard and metal clip in desired colour. I have used an A5 board for this project. I have use Annie Sloan Chalk Paint. Print out a laser image on paper. 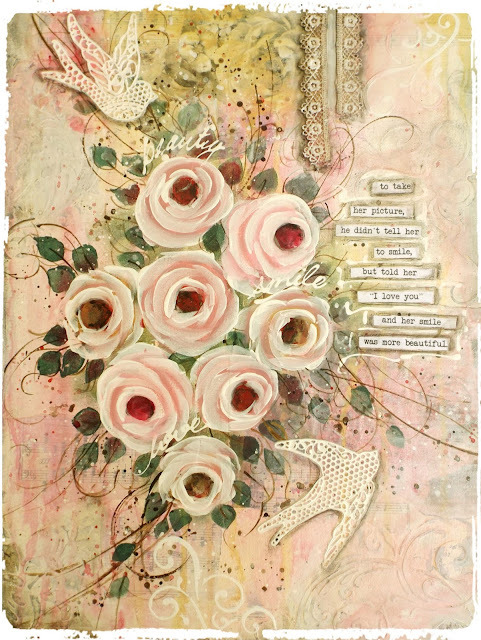 Apply #DecoArt Photo Transfer Medium over the paper image, and adhere onto board. Wait for the paper to dry. 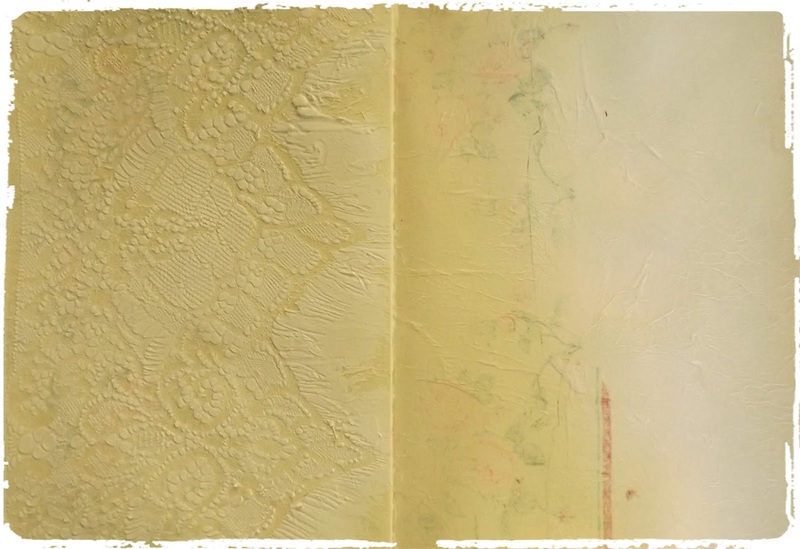 Apply water to the paper and gently rub of the backing with your fingers to reveal the transferred image. 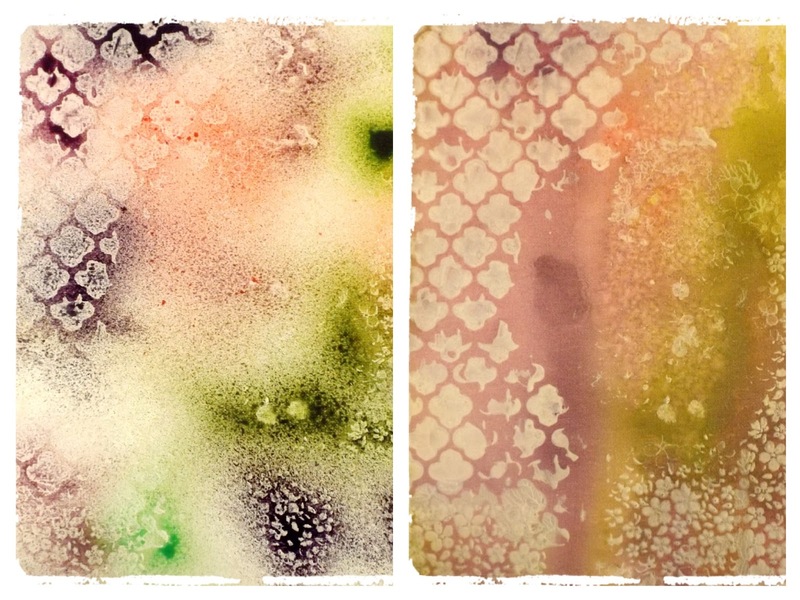 Choose a stencil to your liking. and stencil in the whole background using a foam wedge in grey acrylic paint. 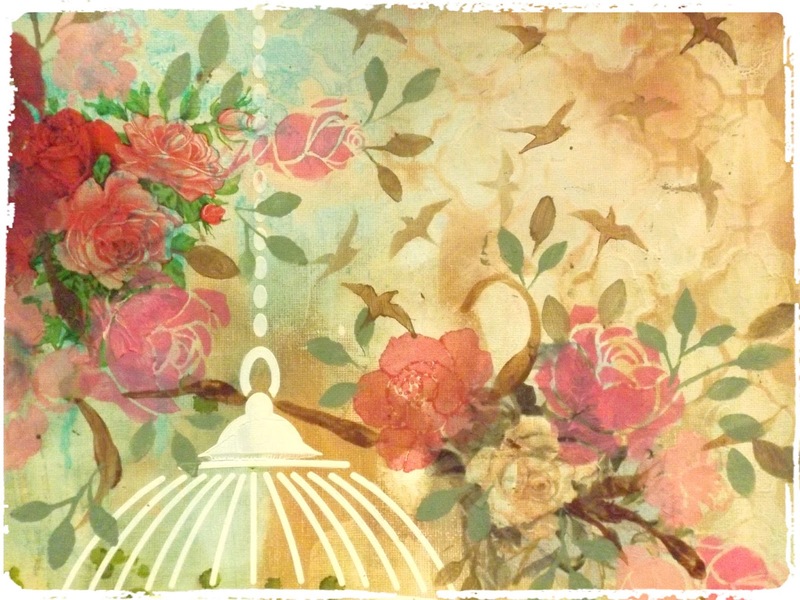 Collage some script papers and washi tape into your background. Paint in your circles for flowers and leaves. You may also choose to stencil flowers if you prefer. Finish painting in your roses using an angle flat shader in White acrylic paint. Apply Texture to the background using Modelling/ Texture Paste with a palette knife. allow to dry. Apply wax paste to the metal clip and the clipboard edges. 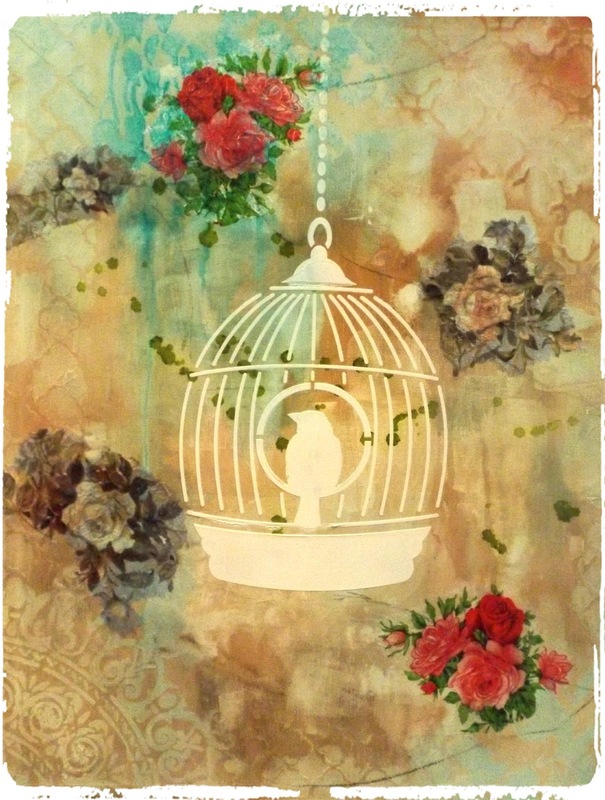 I have used # DecoArt Metallic Lustre Iced Expresso. 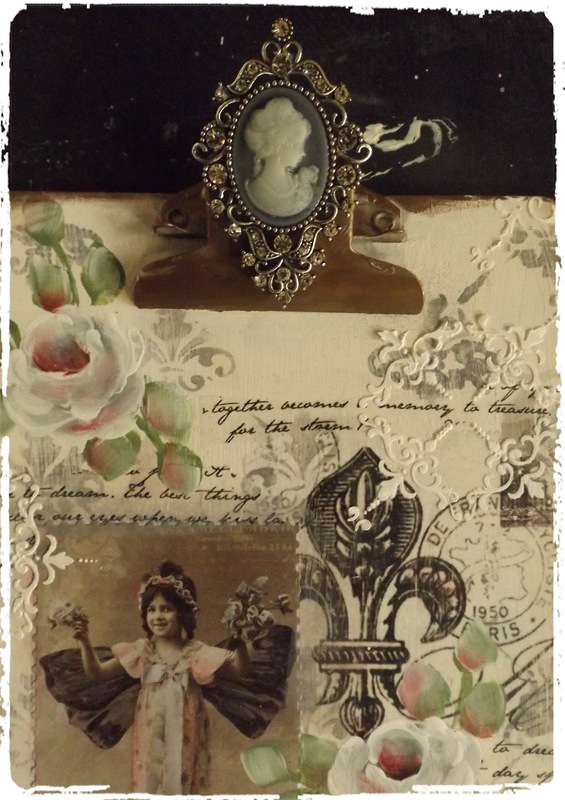 Use a hot glue gun to secure the cameo brooch onto the clip. Finishing : Add your own message to your clipboard. 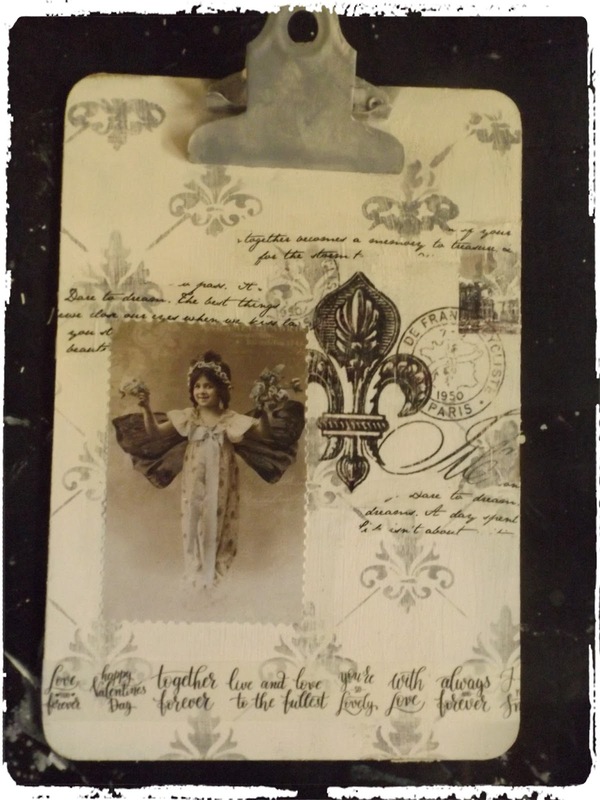 I have used some Tim Holtz adhesive words, stamps and handwriting combined. 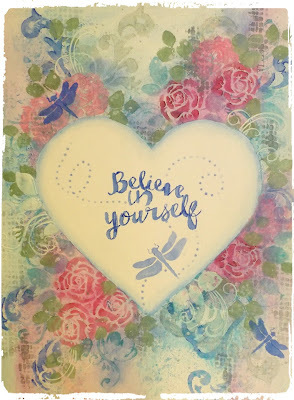 Stamp the butterfly stamp ( Kaisercraft) using Stazon Black Ink into the background. Try and stop at making one! I thought I would post the tutorial here for others to share! 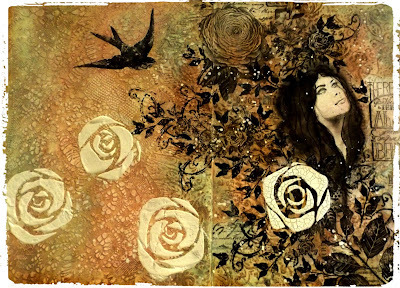 May your creativity be inspired and blessed! Step 1. 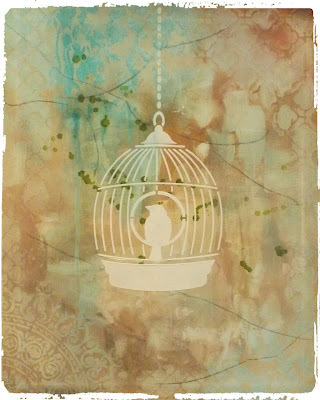 Using stencils and modelling paste, add your texture to canvas. 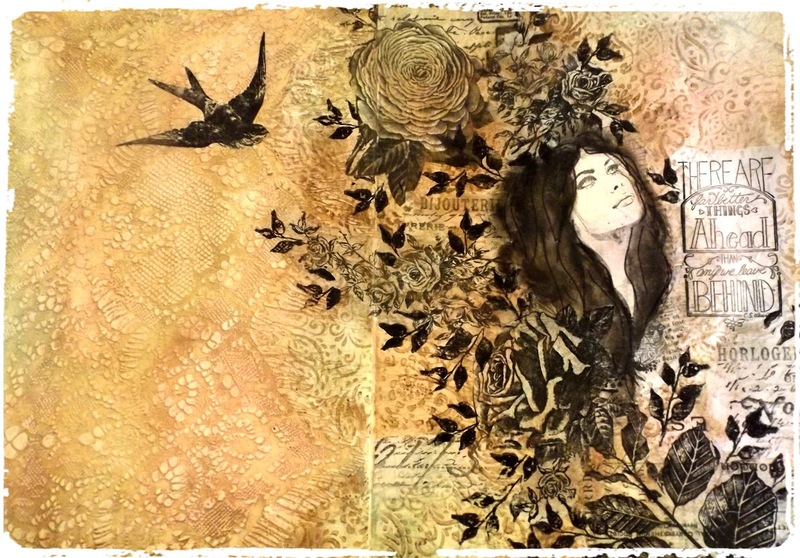 When dry paint over in a dark colour, I have used burnt Umber. 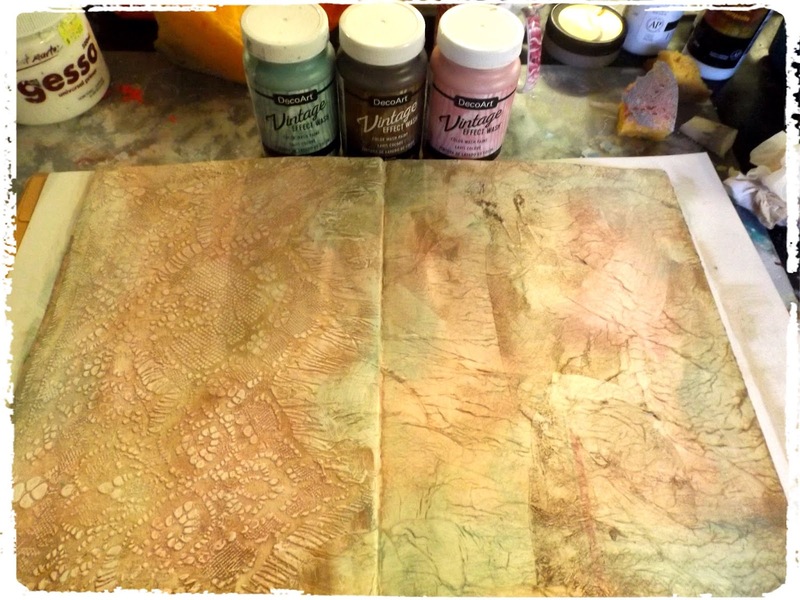 Rub a little Vaseline over the edges and texture, basecoat over the entire canvas with your background colour. 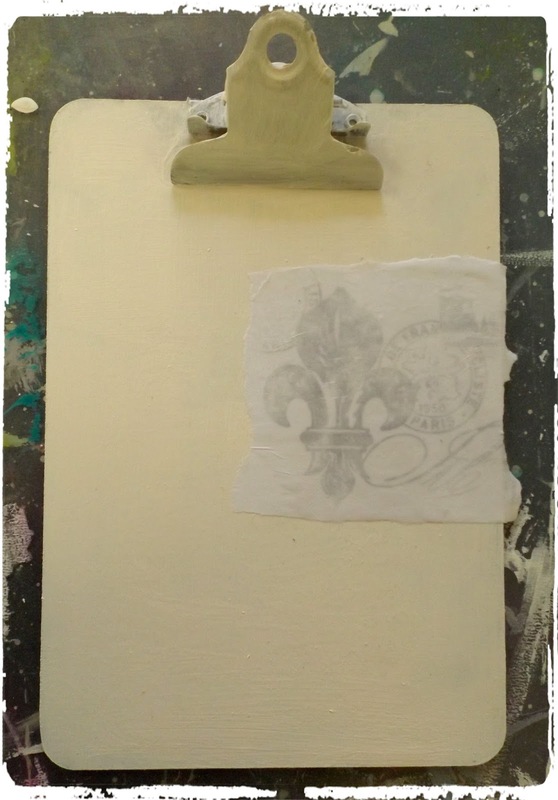 I have used #decoartAmericana Décor Chalky Finish in the colour "Lace"
Step 2. 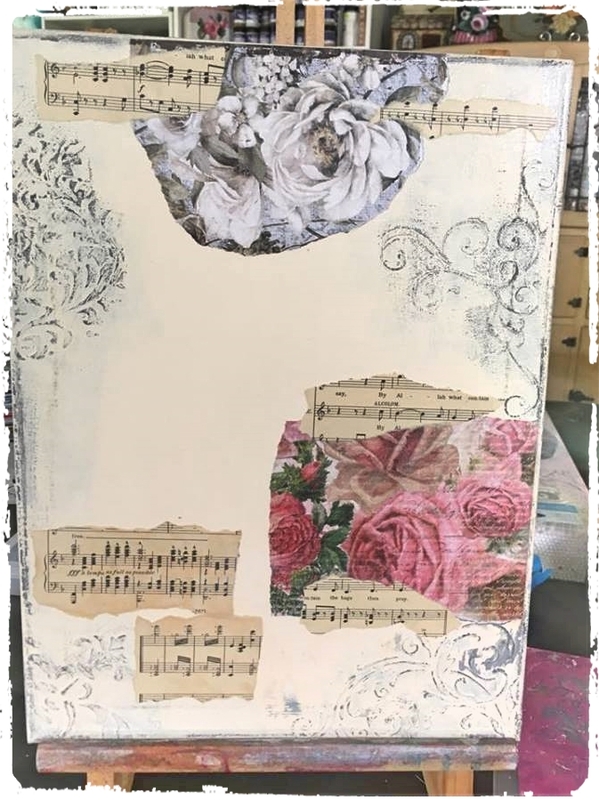 Adhere your collage papers to the canvas, I used Decoart Decou-Paige matte sealer.Apply a little Gesso over canvas to tone down the colours of papers. Step 3. Place your stencil into position. This stencil is my own design and can be purchased by contacting me directly. Step 4. 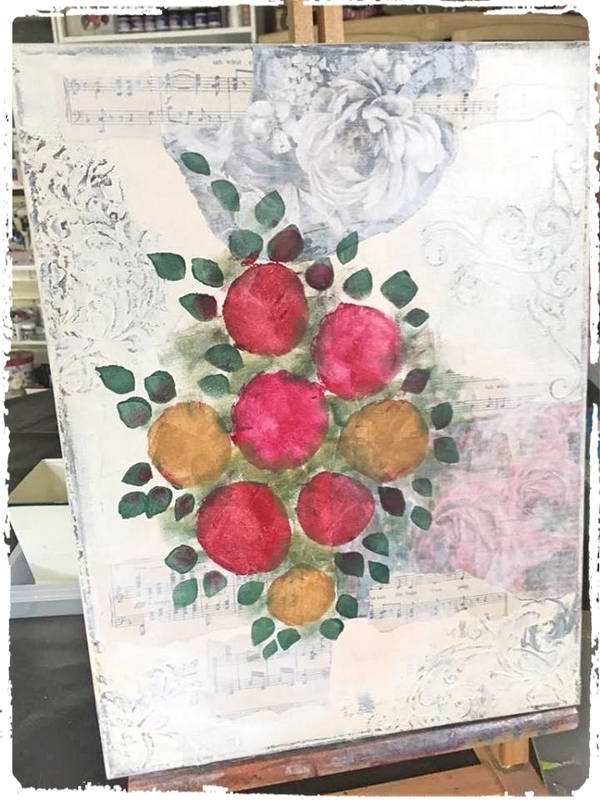 Add a little green paint in amongst you roses and leaves using a small sponge. Step 5. Use some acrylic or ink spray into the background of canvas. 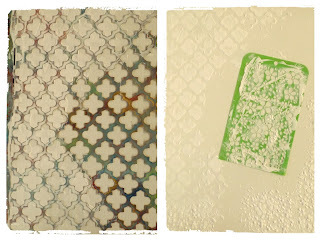 Use a fan brush to add paint speckles in both White and burnt Umber. Using a liner brush add some tendrils coming out from your leaves. 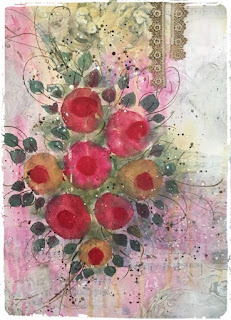 Add a darker center into each rose circle. 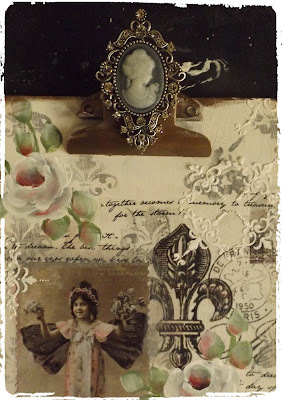 Adhere some vintage lace to the top of canvas. Step 6. Using an angle shader add Titanium White petals to the rose shapes. Step 7. Finshing details! 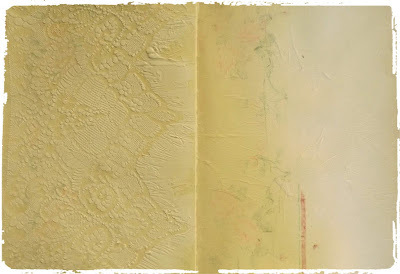 Add some top layer texture to edges of canvas with white modelling paste. Choose some words to express the "feeling" of the canvas. 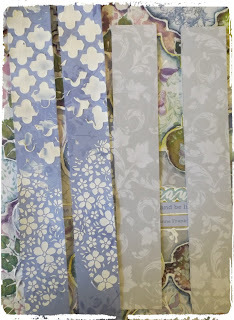 I have cut my words into strips and then glued, outlining with an Inktense pencil and smudging a shadow. I have made my own bird embellishments with a silicone matte, and used matte medium to attach. Using a needle tip bottle of white paint I have handwritten some key words around my roses for emphasis! Paint the canvas edge and rub a little of that colour into the corners for depth. 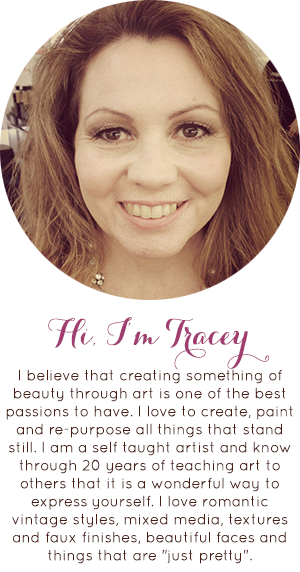 Enjoy creating, Bring a piece of beauty into your world! 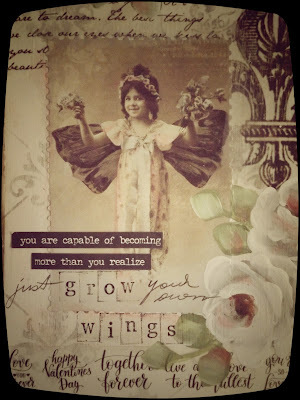 Soar ------ Don't Forget to Fly! Still Working on my Birdcage Canvases. 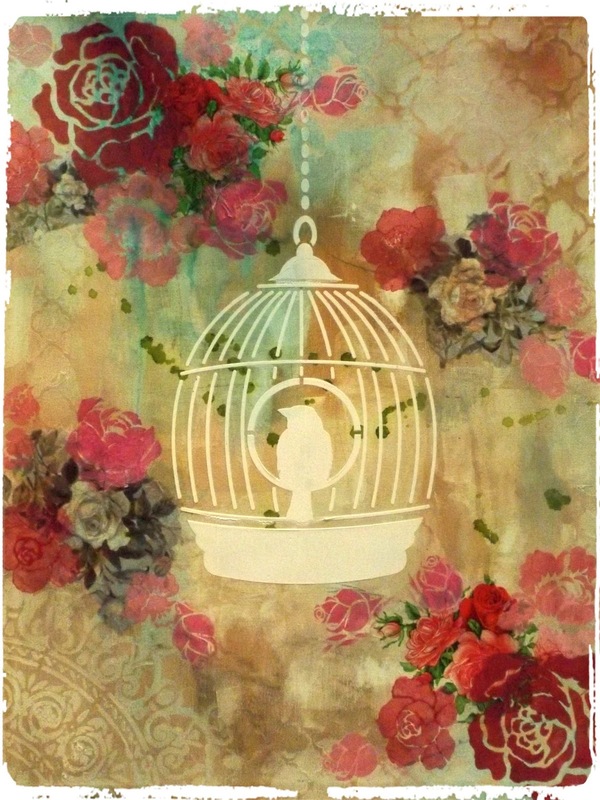 Love the images of what freedom means to different people. Step 1. 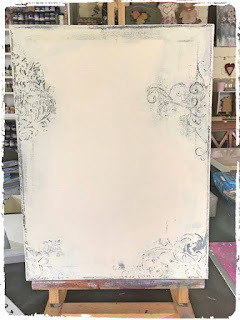 I know it is hard to see in the photo, BUT the first step is to use various stencils to create patterns around the outside of your canvas with Gesso, then brushing some through the middle of canvas. Allow to dry. Then add a few drops of acrylic ink. I have used brown, turquoise and pink ink. Step 2. 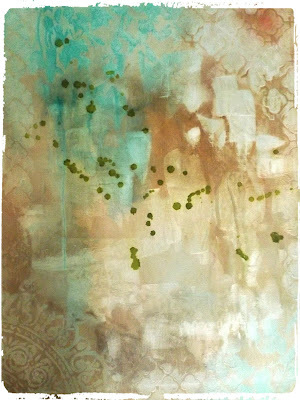 Use a baby wipe to spread the ink around, allow to dry, then wipe again to reveal the resist pattern. I have dropped some green Alcohol Ink through the middle. Step 3. Using Texture Paste, apply your stenciled birdcage image using a pallet knife. Allow to dry. Draw in some loose branch placement using willow charcoal. Step 4. Choose your napkin paper designs, tear out the flower images and adhere to canvas along your branch lines. I use Decopage Napkin Medium for this, but Modge Podge will work as well. Step 5. Using a makeup sponge apply stenciled roses around your tissue images in various shades of pinks. Use as many different rose shapes as you like. Step 6. 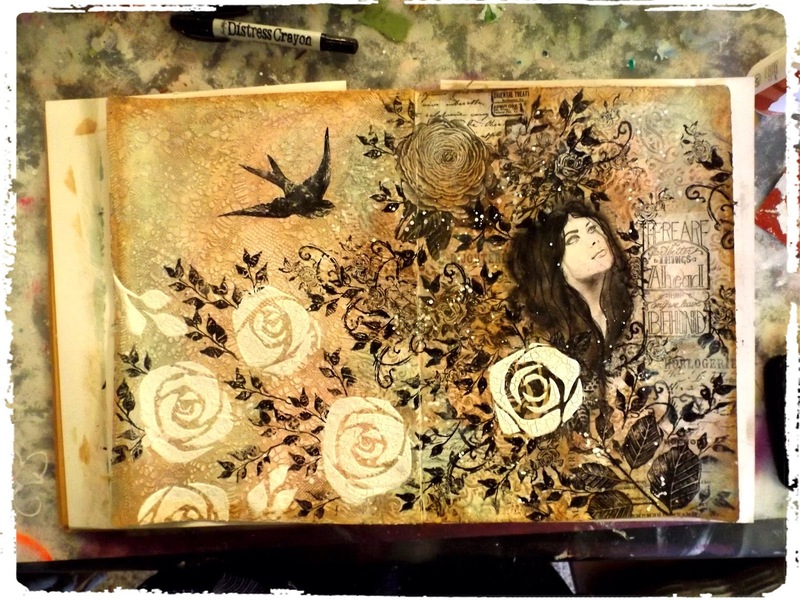 Using a round brush add branches in brown , thin the paint a little before painting. Choose a leaf stencil and add leaves around design, choose a couple of different leaf colours for variation. Step 7. 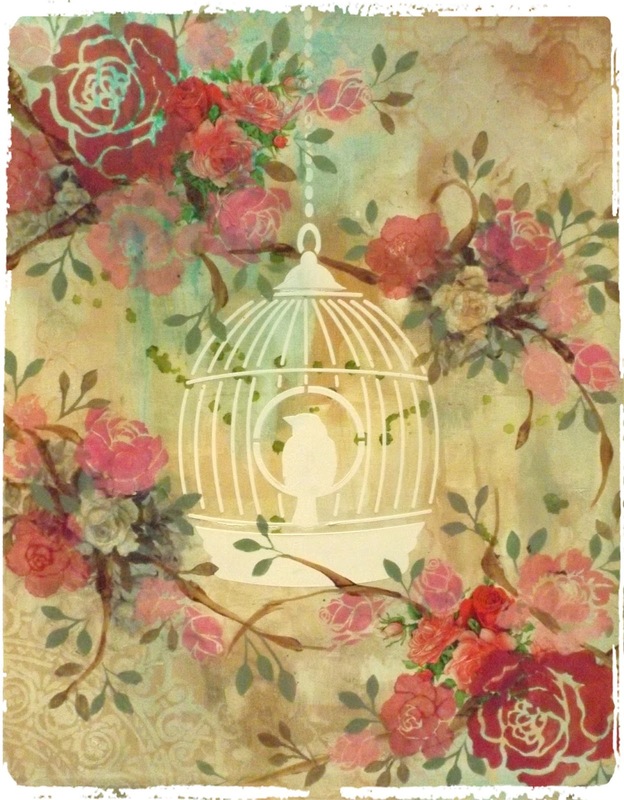 Add stenciled detail of small swallows into the top of design around birdcage. Step 8. 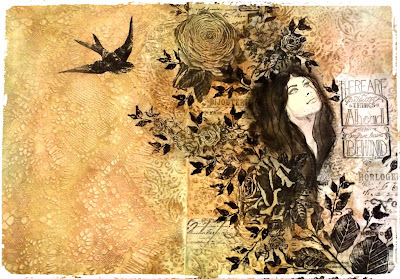 To finish design, add a last layer of texture. 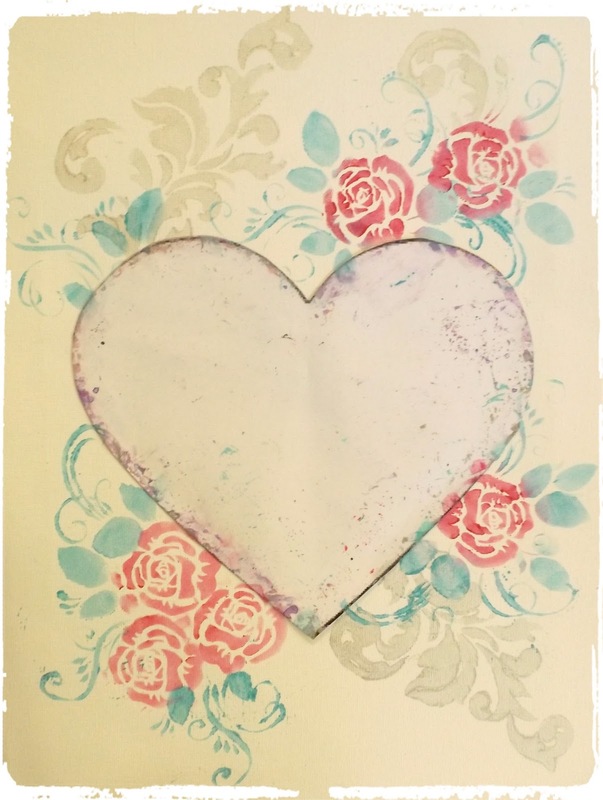 I have used a small rose stencil and applied Irredescent Paste . 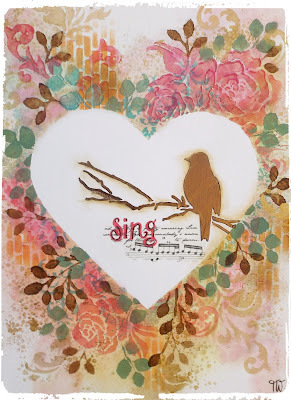 For added Scroll stencil and word stencils , I have used regular white Texture Paste. 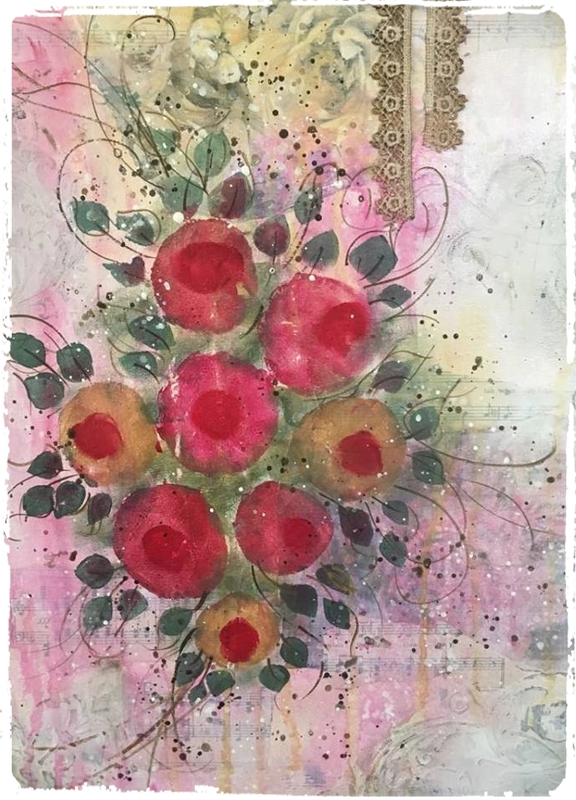 I have painted the edges of my canvas using Decoart Extreem Sheen Metallic Paint in Pink Tourmaline, this is also used as one of the rose colours. Enjoy Creating your own version! 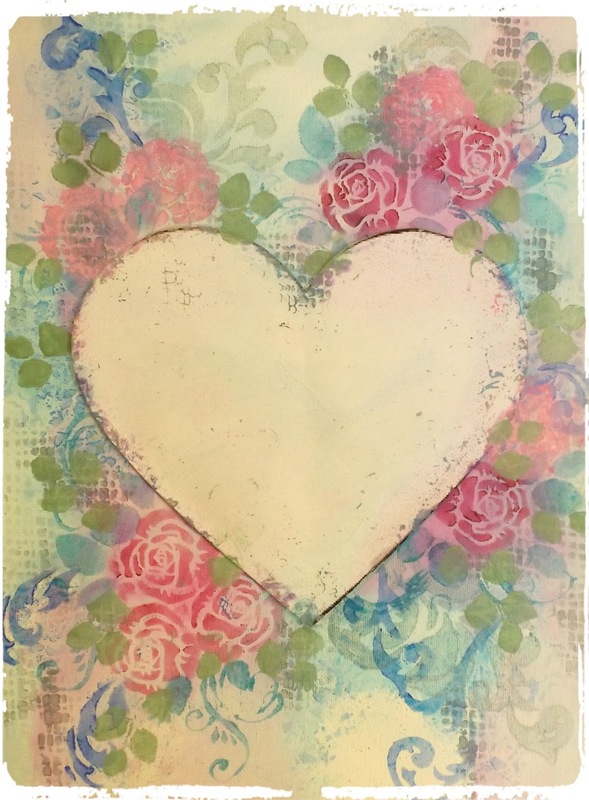 Painting Tutorial "What does your Heart say?" I painted this canvas as an encouragement for my sister. I wanted to inspire her heart. 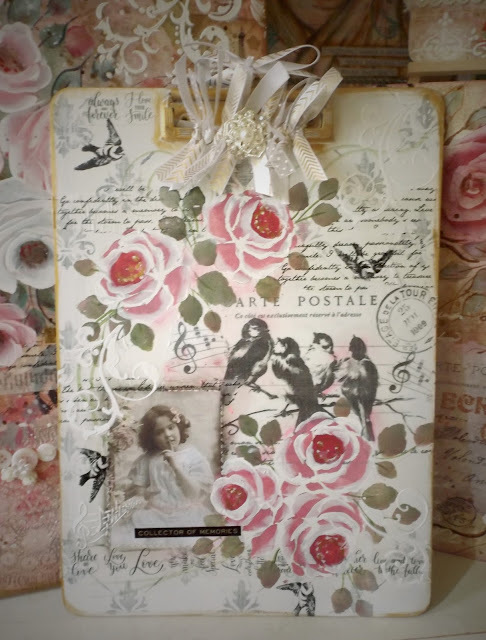 I love this project, I have used this idea over and over, with results always unique! Step 1. 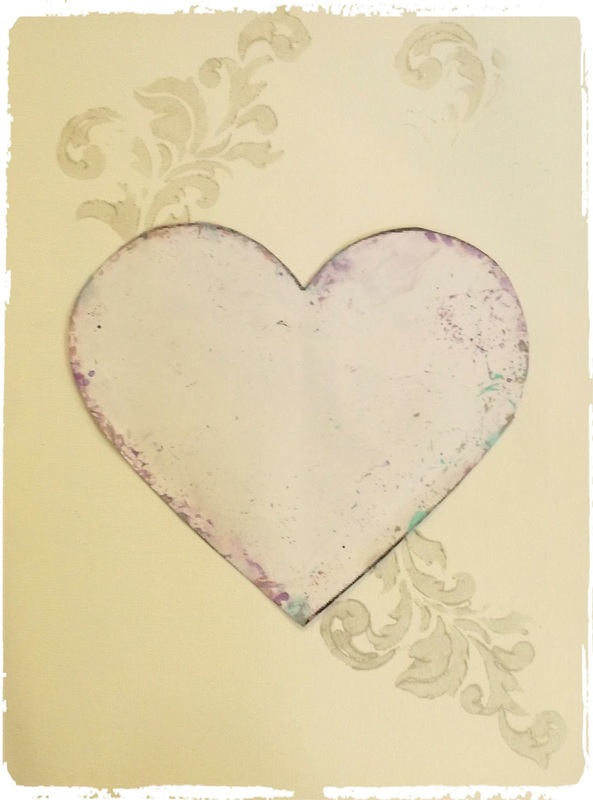 Trace and cut a large heart out of a piece of cardboard, then cover it with contact both sides. Adhere the heart to canvas using double sided tape in a few places. 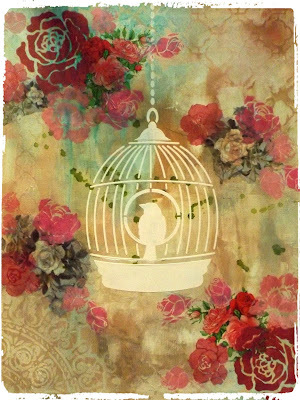 I have not painted the background of my canvas, you of course can paint it any colour you like! Choose acrylic paint colours and various stencils to start. 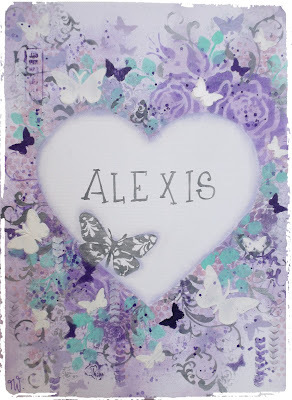 I use a dry makeup foam wedge for this type of stenciling. Step 3. More layers! Try to use a variety in your work, small patterns in the background and larger patterns for the feature around the heart. Step 4. Using a palette knife, add some white texture paste through a stencil, I have chosen a scroll style. I stenciled these words inside my heart then added the dragonflies in and around the heart for detail. To finish I spayed a little blue, then aqua ink around the heart and with my sponge worked the colour into the background. I decide to define my heart by shading some Ultramarine blue around the inside of the heart using an angle brush. Finished! 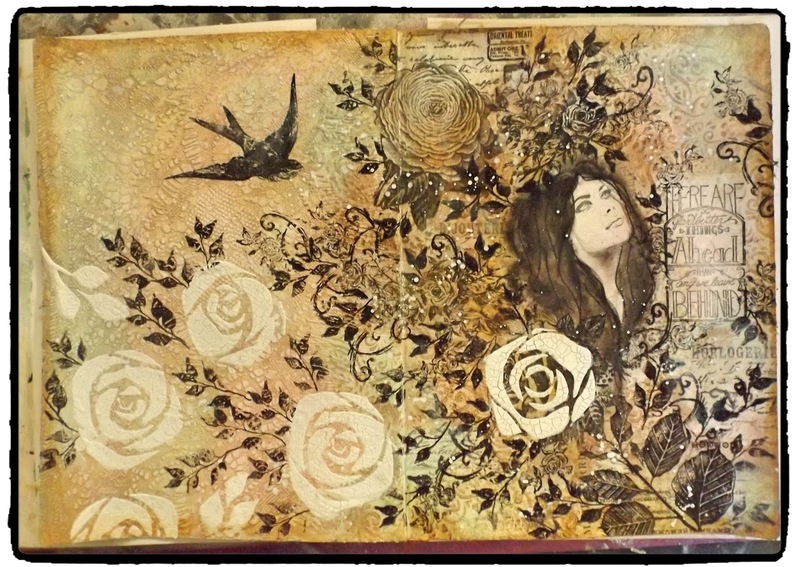 I have added some photos below of some of my other "Heart" works. Enjoy, and create your own! 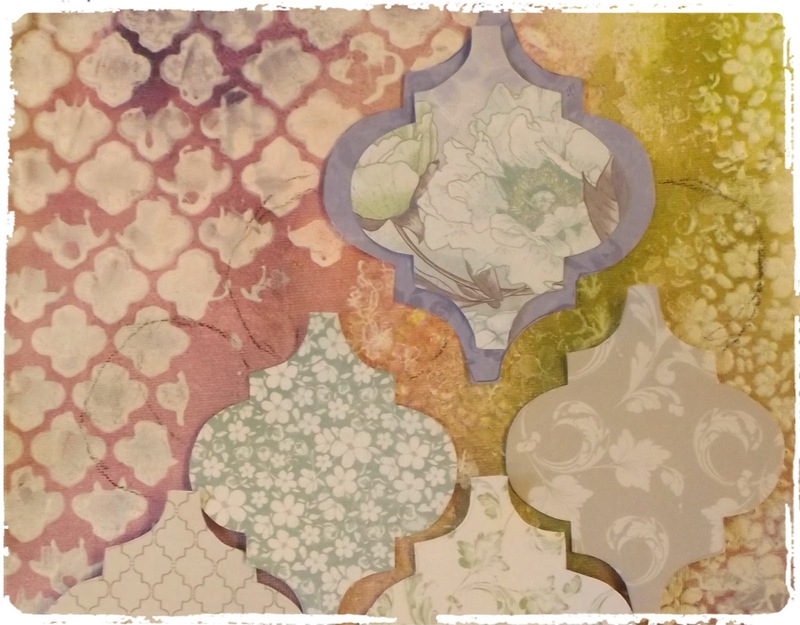 "Think of all the Beauty still left around you and be Happy"
When I first saw the collection my eye and imagination were drawn to the subtle Moroccan paper and tiny wooden shapes. I love Moroccan design but wanted to use the soft lilac colours and the imagery of a vintage flowery garden, using the Moroccan shapes like a lattice backdrop. I hope you enjoy and learn heaps from the process of this creation! Step 1. 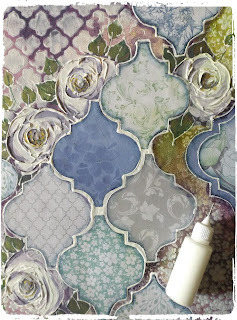 Using a palette knife spread Gesso over the Moroccan Lattice and Blossom stencils. Allow to dry. 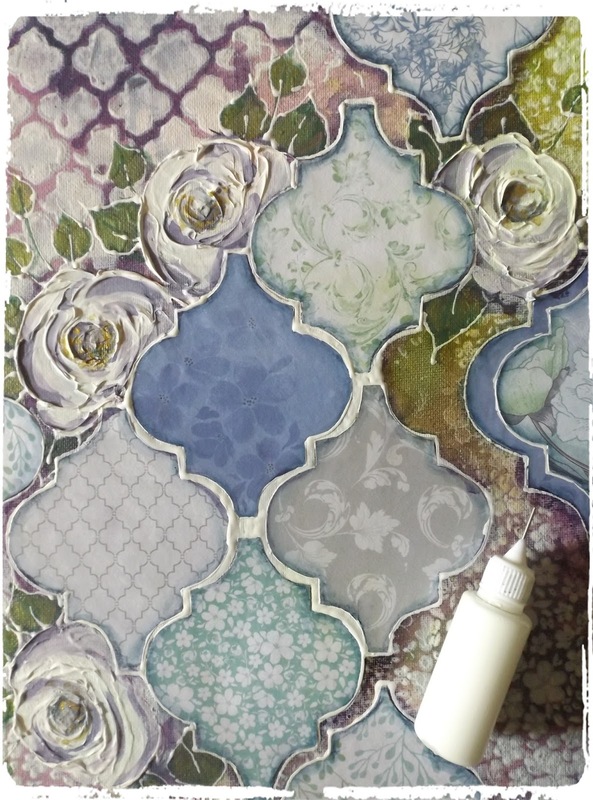 The Gesso will act as a resist for your next step! Step 2. 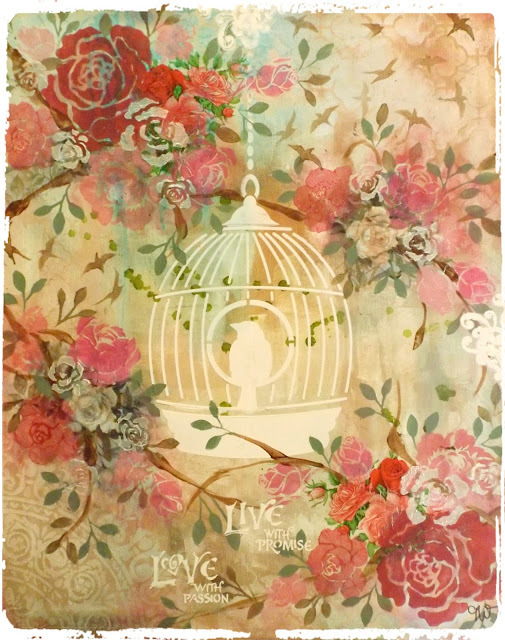 Spray KAISERmists over your canvas, spray a little water to activate and allow the inks to run through the stencil designs. Step 3. Choose a Moroccan shape, cut it out to make a template then cut this shape out of your chosen Kaisercraft papers. Decide where your main papers will be and draw in circles where your roses will be placed on the canvas. Step 4. 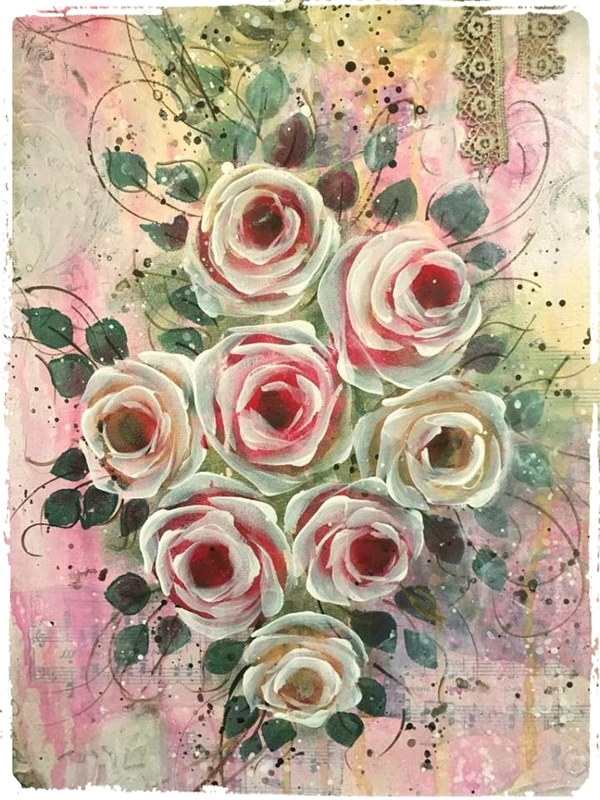 Using a small palette knife, load with texture paste and form your rose shapes. Step 5. 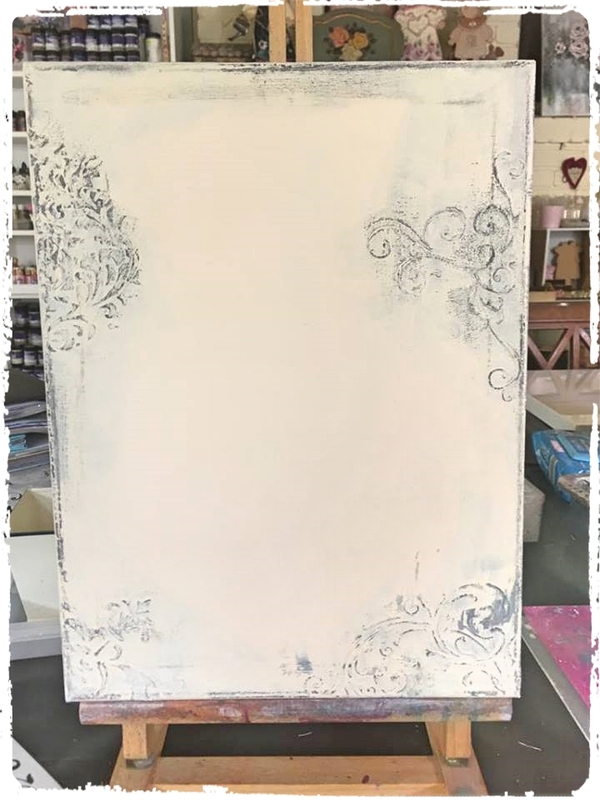 Glue down your paper shapes onto canvas using Kaisercraft Glaze Paste or Modge Podge, make sure you coat the top of your papers as well. Step 6. 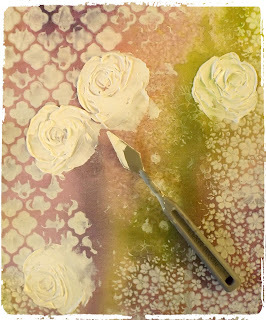 Spray a little Blackberry KAISERmist onto a palette, using an Aqua brush place this colour into roses for depth. Kaisercraft Gold Gel Pen for centers. 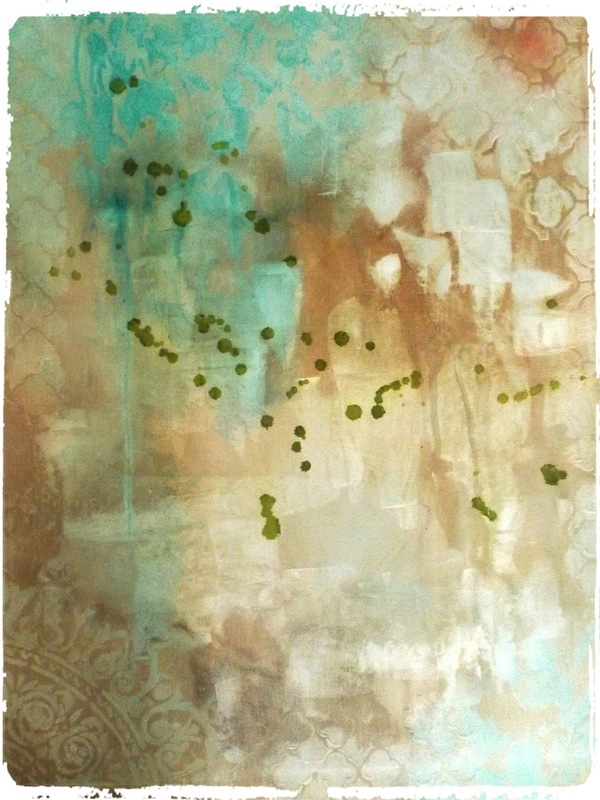 Use a small filbert paintbrush to paint in leaf shapes in Heritage Green, then highlight with Metallic Gold paint. 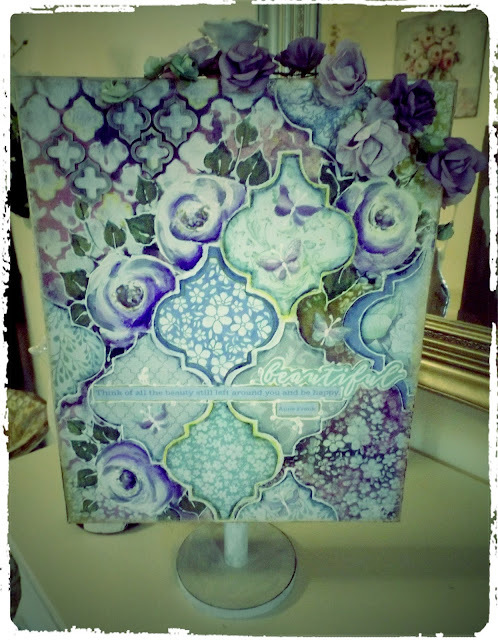 I have used an Inktense Pencil in Indigo Blue to shadow the paper Moroccan shapes with the Aqua brush. Fill a needle tip squeeze bottle with Kaisercolour in White and outline leaves and Moroccan shapes. Step 7. Finish the detail of your design, I have glued the paper sentiments and butterflies from the Lilac Whisper Collectables to my canvas, outlining them in White. 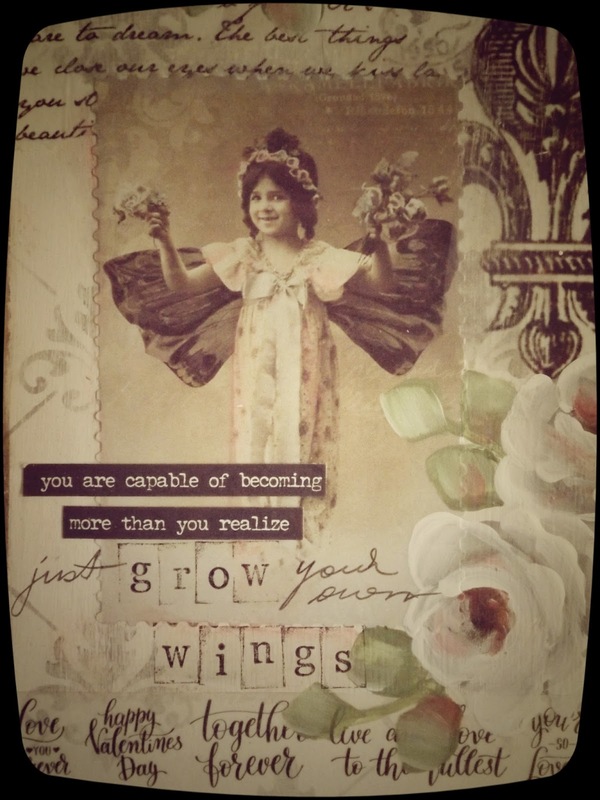 I love this saying from Anne Frank, I have visited her house in Amsterdam, which is now a museum , and just had to use it in this piece! 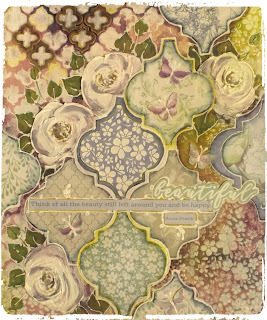 I have used the Blossom stencil again with Texture Paste to enhance one Moroccan shape. 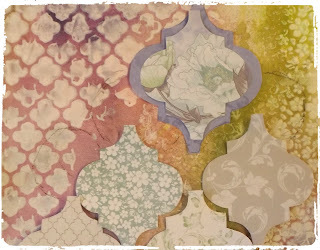 Adhere your wooden Moroccan shapes over some of the background lattice pattern. Rub over them with Metallic Gold. 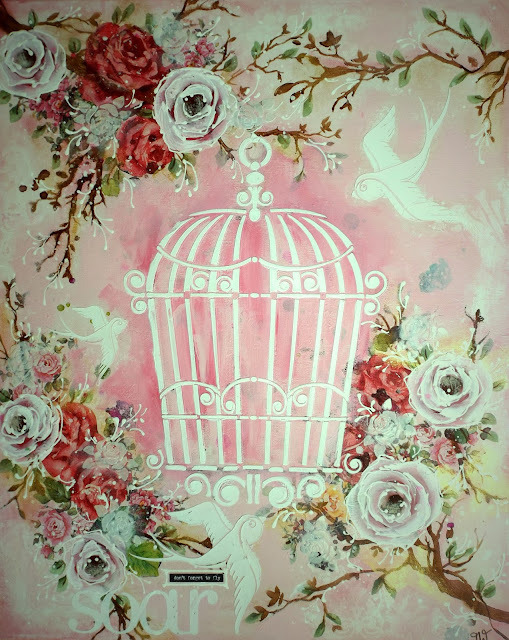 You could stop here and hang your canvas, but I wanted more of a statement piece, So lets keep adding! Step 8. 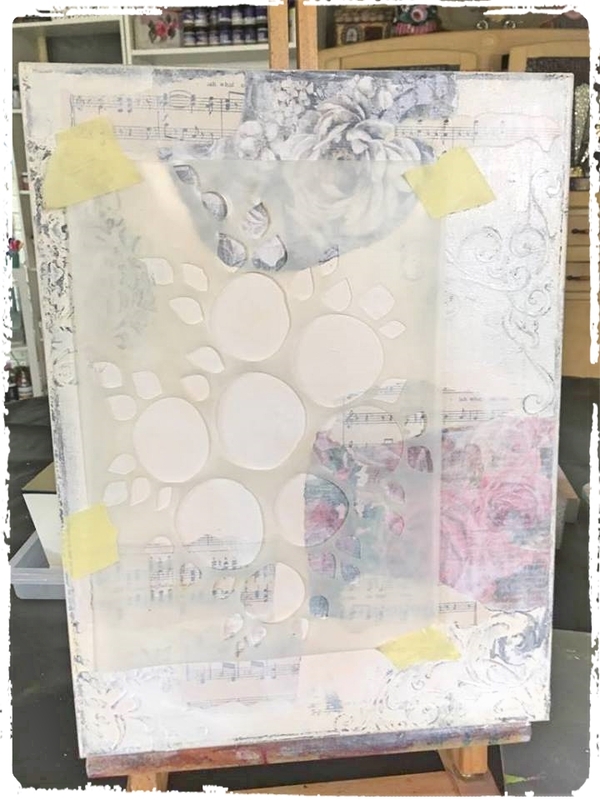 Cut strips of paper to cover the sides of your canvas, use your stencils to add extra patterns to the sides, spay with KAISERmist in Blackberry to enhance the pattern. Glue into place. Step 9. 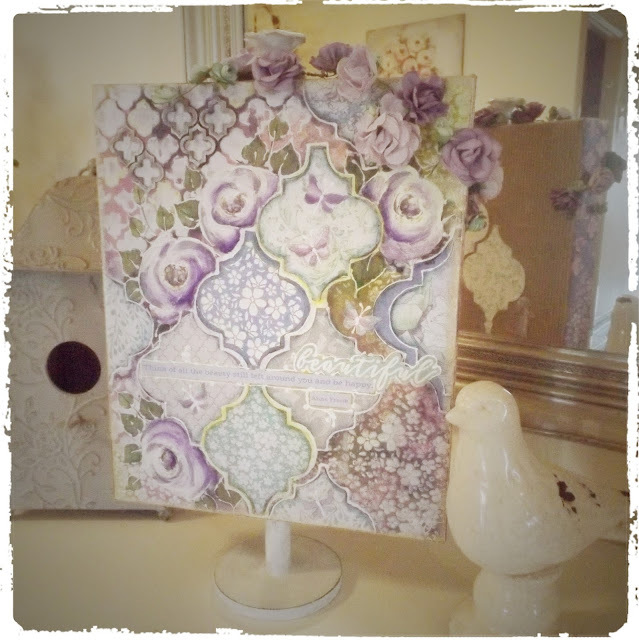 Using Kaisercraft Corregated Cardboard, cut to size for back of canvas, adhere some of your Moroccan shapes and embellish with pieces from the Lilac Whispers collectables pack. Glue this onto the back of canvas. Step 10. 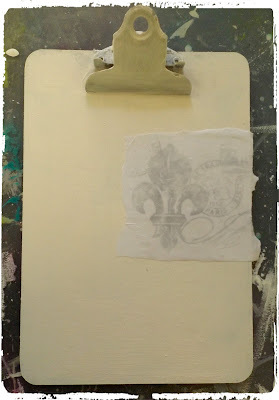 I have hot glued a white ceramic rose knob to the top of my canvas. 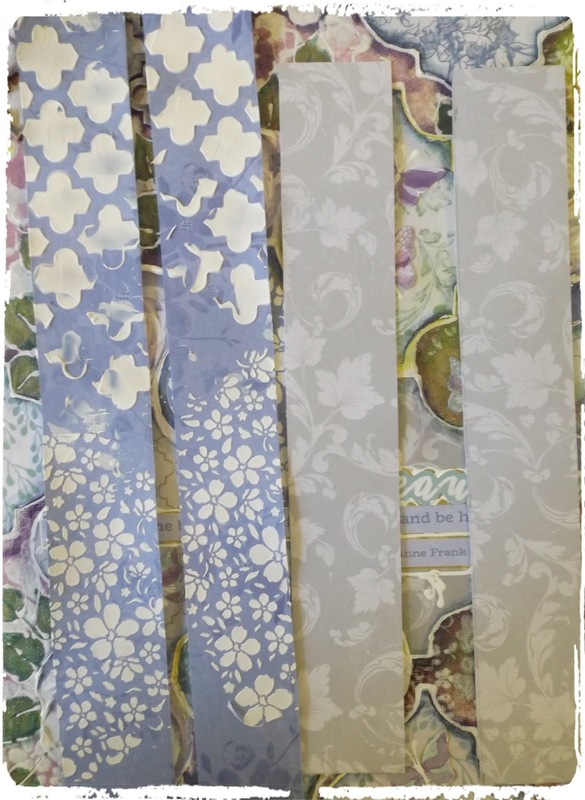 Intertwine your paper blooms by their wire stems, into a long garland and wrap them around the knob, trailing down your canvas design. Then I have drilled a small hole into the bottom of my canvas and screwed into place a flat based knob that makes my canvas able to stand. Finished Canvas! Able to be displayed anywhere for a full 3D experience. I had a lot of fun creating this piece, I hope I have inspired you to get creating as well! Kaisercraft Glaze Paste, KAISERmists Iridescent Spray Ink in Olive, Blackberry, Wisteria and Pink. 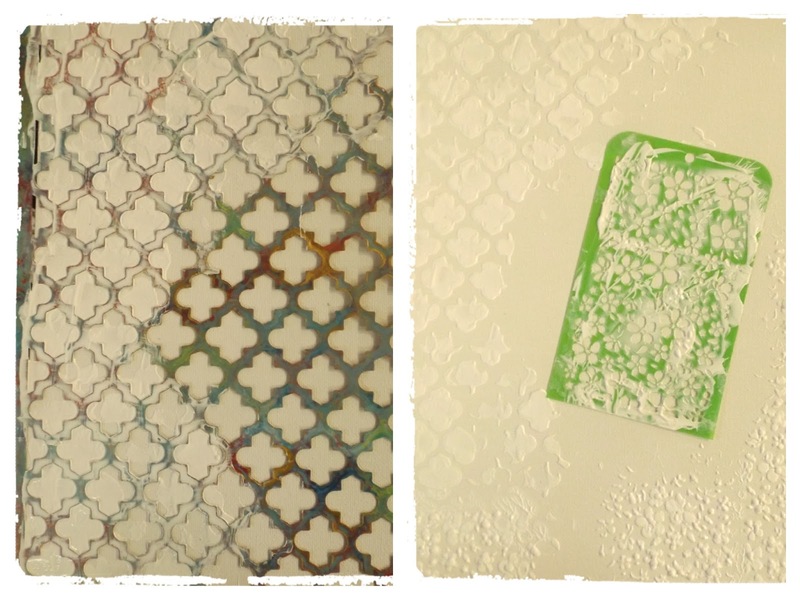 Kiasercolour in White, Heritage Green and Metallic Gold. Lilac Whisper Collectables. 12" x 12'' Moroccan Lattice Stencil, Mini Designer Template "Blossom"
Mini Paper Blooms " Sage", Paper Blooms " Amethyst"